Dance Commentary by Heather Desaulniers: "Rice"
A male dancer walked across the back of the stage carrying a long flexible wooden pole, stately and focused, while live video projection commenced on the cyclorama. One by one, a group of women joined the scene and a percussive stamping phrase developed. In parallel, they rose to relevé, then fell heavily into plié, accompanied by audible breathing. This pulsing sequence would repeat again and again, becoming evermore determined and resolute. A stylized contemporary dance phrase emerged out of this initial statement, one with windmilling arms, flexed attitude extensions and circular patterning – all choreographic motifs that would recur in the next hour. 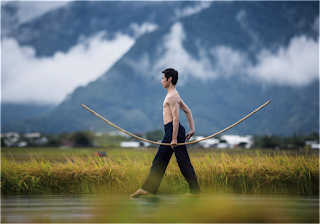 These were the first moments of Cloud Gate Dance Theatre of Taiwan’s Rice, an evening-length ensemble work choreographed by their founder and Artistic Director Lin Hwai-min. Presented by Cal Performances for two shows this weekend, Rice, in its continuous eight segments, tells a narrative of intersection and connection – where human experience, community and culture meet the natural environment through agriculture and sustainability. While the opening of Rice was absolutely gripping, the first third of the piece took a while to get going, at least for me. The choreography, movement and staging were varied to be sure, but the dynamic level stayed very much the same for quite a long time, lacking in highs and lows. However, as the dance reached its mid-point, dynamics changed drastically and the stage erupted with different energies and intentions. A couple entwined in a sensual, yearning and passionate duet, framed by a video of rustling green flora (the gorgeous backdrop projections changed throughout the work to provide narrative dimension and context). Later, a woman costumed in a reddish-brown dress took the audience’s breath away in her tortured, contorted solo, full of pain and despair. The men’s group dance towards the end of Rice was also something to behold. Carrying those long wooden poles (which factored heavily throughout the work), their powerful vignette oscillated from a grand and contained procession to a wild and stormy battle. Rice’s final chapter closed as the women of the company plodded heavily around the stage in lamentation, contemplating the sometimes-harsh realities of nature. But what struck me most about Rice was its form and composition. The piece contained incredibly advanced, innovative, specific, technical (and beautiful) contemporary choreography, informed by a strong narrative undertone. All tenets of modern dance. But post-modernism was equally at play - pedestrian walking, running and directional shifts; tasks of rolling items across the stage and carrying harvesting implements; a blurring of the space between life and art in the narrative. It was a multi-genre work. And the two genres were not turned into some kind of hybrid. One did not dominate the other. The complexities and nuances of both were celebrated and woven together seamlessly to create depth, layering and accessibility. With Rice, Lin Hwai-min has accomplished a complicated structural feat; a vibrant and successful statement of tandem modernism and post-modernism in twenty-first century dance performance.